What type of Adjustments can be made? Note: All pricing adjustments are based off of the base rate of each vehicle. You set this by navigating to Vehicles > Select a vehicle > Prices. Within the 2 rules listed above, you have 3 types of pricing adjustments that can be made. All of which revolve around increasing or decreasing price. The image below displays the 3 types of pricing adjustments and a short definition. Now that we know the basic adjustments, lets move into the 2 different rule types. Weekly pricing? Monthly pricing? Anything in between? This is where you make these changes. You also have the opportunity to charge based on days that may tier down. For example, 0-3 nights costs x, 4-6 costs x, and 7-14 costs x. This can all be done via the "Based on length of booking" price adjustment. The screenshot below is an example of setting up a weekly rate of exactly 200 per day, and a monthly rate of 175 per day. Offer a discount or add free days. 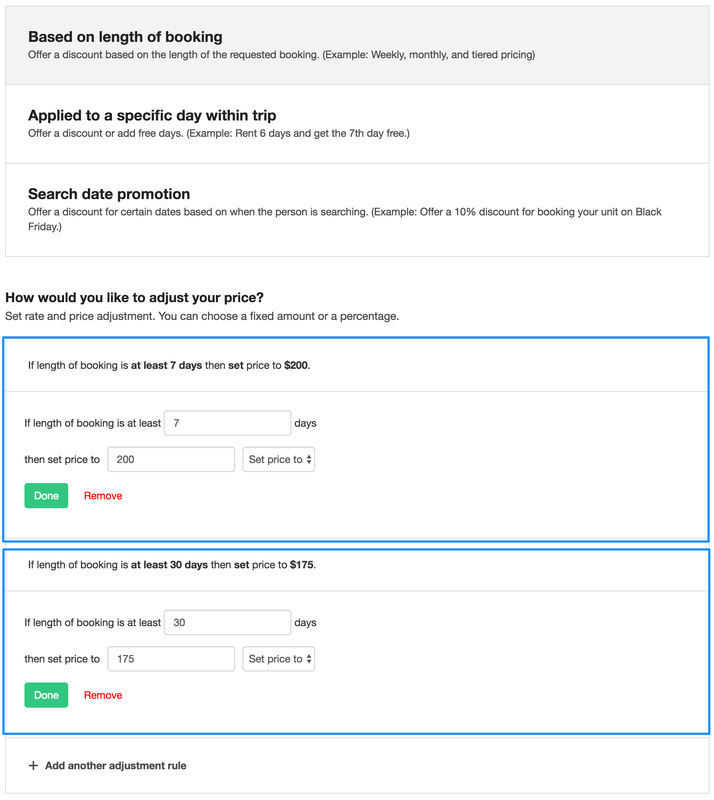 If you're wanting to offer a discounted day based on the day within the trip, you can do so by entering the day you want to discount, then apply the amount you're decreasing it by. This would make the nightly rate of just the 7th day, $0. You can always make it a discounted % as well. Don't hesitate to reach out with any questions, we're here to help!